THERE ARE SEVERAL DIFFERENT STAGES OF GARAGE DOOR OFF TRACK CONDITION. WE HAVE TRIED TO SHOW EIGHT LEVELS IN ORDER TO GIVE YOU AN IDEA HOW MUCH IT WILL COST TO FIX A GARAGE DOOR OFF TRACK. 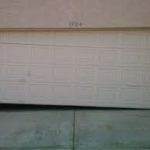 BROKEN SPRINGS, SEVERED TORSION TUBES AND ROOM TO WORK CAN AFFECT COST TO FIX A GARAGE DOOR OFF TRACK. 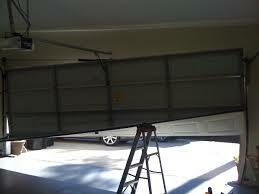 YOU SHOULD NOT TRY TO FIX A GARAGE DOOR OFF TRACK ON YOUR OWN. 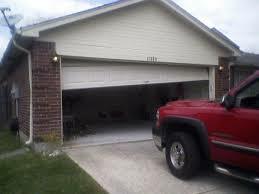 TYPICALLY ALL OF THE HIGHER STAGES OF GARAGE DOOR OFF TRACK SITUATIONS ARE CAUSED BY INEXPERIENCE. 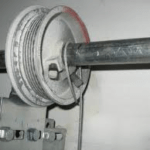 CALL US WHEN YOU ARE JUST DEALING WITH CABLES OFF THE DRUM. All Estimated Pricing For The Various Conditions Can Be Found Here On This Page. Continue Scrolling For More Information or Call Now. 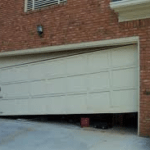 Failure to Service The Garage Door Is the NUMBER ONE reason Garage Doors Crash. 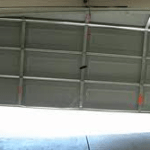 The Most Common Garage Door Service Needs That Can Ultimately Cause Your Garage Door System To Break Are Failing Garage Door Springs Springs, Noisy Dragging, Binding Rollers, And Failing End Bearing Plates. 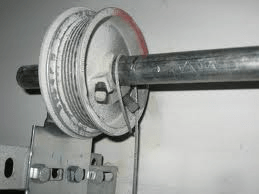 Although, Bad Garage Door Springs, Noisy Rollers that are Dragging and Binding the Door, and End Bearing Plates that Have Gone Bad Can Each Cause The Garage Door To Fail Alone, Without The Presence Of Other Failing Parts, Usually It Is A Combination Of All Three. 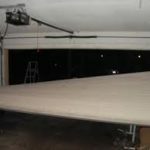 Ultimately, Even if the Garage Door Is Hit By A Car It’s Usually Due To Failing To Perform Garage Door Service, Or Ignoring Garage Door Repairs That Are Required. 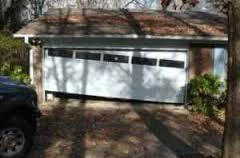 Cables Fraying, Broken Cables,Track Alignment, And Bent Track Can Also Cause The Garage Door To Bind. The Garage Door Opener Can Also Fail. 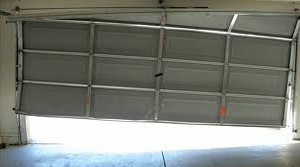 If The Garage Door Opener Sensitivity Is Not Set Correctly The Opener May Push Through An Obstruction That It Is Designed To Recognize and Reverse. 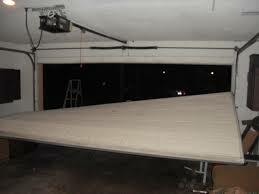 If the Garage Door Opener Sensitivity Does Not Reverse Properly Then There is a Risk Of The Cables Getting Slack. This Slack In The Torsion Cable Keeps The Cable From Spooling Correctly On The Drum. 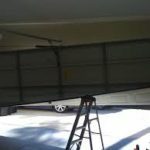 The Garage Door will Fall. 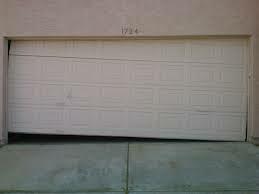 If your door has come off its tracks give us a call. We’ll dispatch a professional technician to you. 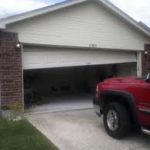 The technician will assess the situation and give you a detailed account of what is wrong and what needs to be fixed in order to get the door back into operating condition.
! 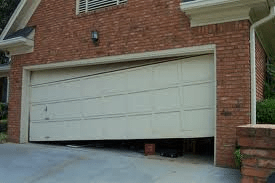 !Crashed Garage Doors Are NOT Stable and Dangerous!! → Sections are not damaged, track may or may not be damaged, but the door can be saved. → Torsion Tube May Be Cut At Bearing Plate. 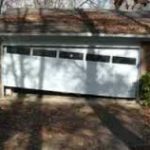 → Garage Doors Had Severe Failure. Sections Are Not Damaged, Track May Or May Not Be Damaged, But The Door Can Be Saved. This service will get the door back on track safely without causing additional damage to the door. Doors fall due to missing or failing parts that will need to be replaced in order to warranty to door from future failures. No warranty on this repair when bad parts are not replaced.